The largest city in the Baltics, with a population of about 815,000, Riga has a reputation both good and bad. The good side, they say, is very good and the bad, well it can get pretty grim. On the plus side, Riga has some of the best nightlife of any European city. Once a playground for the Russian military, many communist colonels took their holidays here and a good number opted to retire in Riga in preference to their more austere homeland. Since the break with communism, Riga has gained in reputation as a fun-filled, fast-forward city. The locals seem keen to re-establish Riga’s pre-war reputation as the Paris of the Baltics. Wedded to the city’s fun nightlife are some very fine buildings, including some of the best art deco in Europe, and a wide cultural mix that reflects the city’s cosmopolitan history. On the downside is a reputation for being a bit of a rough diamond. As a big and cosmopolitan capital with a predominantly Russian population, it can seem a little out of control, if not chaotic. Latvians make up 57 percent of the population but you will hear more Russian spoken here than Latvian. Its economy, so long in the doldrums under the communists, is now booming. Riga also has some of the worst traffic in Europe and even worse drivers. Indeed, motorists in Riga appear to have a death wish and show no regard whatsoever for pedestrians – be warned. Fortunately, Riga treasures its past as much as it welcomes the future. Old buildings aren’t being torn down to be replaced with modern concrete towers (except for a few Stalinist monstrosities worth a look just for their sheer ugliness). It may have lost its medieval treasures, but you can still turn a corner to find cobbled courtyards and turn-of-the-century vistas that will take your breath away. As a weekend city break, Riga may not strike much of a chord with unseasoned travelers, but this is a rising star in the city break market and one of Northern Europe’s most exciting new destinations. 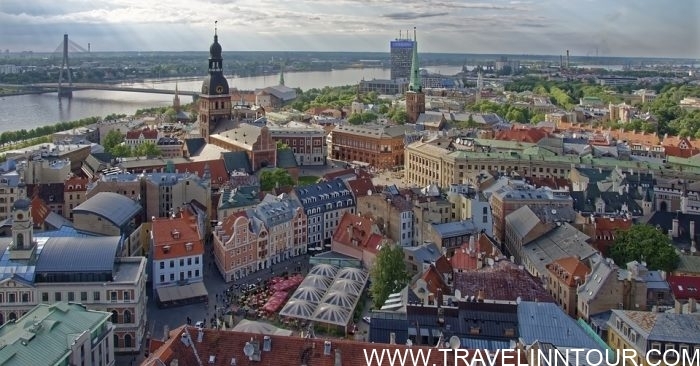 Riga is emerging as a popular weekend break destination as it shakes off 50 years of communist rule and Riga city breaks are becoming hugely popular as cheap flight travel bargains open up new markets. The layout of Riga city is a great help to those on a short weekend break. It is split into the Old City and New City, separated by a canal and a series of pleasant parks. The Daugava River flows to the west of Riga Old City into the Gulf of Riga to the north. The parks are in parallel strips on the eastern edge of Riga, running northwest to southeast with the neighboring streets lined with former 19th-century mansion houses. Further north and east are the industrial estates and residential zones. Traveling around Riga is relatively easy and cheap. Riga has a good travel network of trams, trolleybuses and normal buses. In addition, Riga has a minibus system of taksobuss or mikroautobuss which covers longer distances. In any event, most of the best sights of Riga can be seen on foot. The Old City is relatively small and most of the New City sights are walkable too or have good tram and bus connections. For visiting attractions outside Riga, a car is useful but many sites are serviced by public transport and there are plenty of organized tours. Sightseeing in Riga is a pleasure, thanks to the layout of the city. Most visitors head for the Old City on the eastern bank of the river where the medieval, cobbled streets are clustered around the magnificent Dome Cathedral. Despite much damage from two world wars, Riga has managed to restore most of its important historical sights and a walking tour of the city is like a step back in time. Important and interesting sights in the New City, on the west bank of the river, are also within easy traveling distance either on foot or by bus or tram. The city is also packed with museums of almost every description. Most tourists will buy the Riga Card which not only includes discounts in selected restaurants, cafes, and theatres but also a free walking tour, free entry to museums and a free Riga street guide. Cards cost Ls8,12,16 for one, two and three days and are sold at hotels and travel agencies across the city. Riga also has some very interesting off-beat sites and the best thing about them is that most are free. Visitors will be impressed by a large number of parks in the city, most edging the Old City, that provides a breath of fresh air and, at one, a notable zoo. Outside Riga are some interesting castles and palaces, a wonderful and much visited Guaja National Park and the seaside strip of popular coastal resorts known as Jurmala – only 30min by train and now a virtual suburb of Riga itself. The Riga Card not only includes discounts in selected restaurants, cafes, and theatres but also a free walking tour, free entry to museums and a free Riga street guide. Cards cost Ls8,12,16 for one, two and three days and are sold at hotels and travel agencies across the city. The top sights in Riga are a pleasure as the great majority of Riga sights are concentrated in the Old Town to the east of the river. Old Riga is a compact maze of cobbled streets, brick churches, and crumbling 17th-century merchants’ houses that have a fairyland charm about them. Despite bombs raining down from both sides in World War II, and some crass post-War attempts at modernization, Riga still has the atmosphere of a busy medieval city. The main thoroughfare of Kalku St provides a good base for walking tours on both sides of the street. Duck down any narrow alleyway and you are sure to find something of interest. Centuries-old German buildings are dotted throughout the Old Riga city center, known as Vecriga. It’s like a step back in time just taking a stroll along the narrow cobbled streets. It’s worth picking up a copy of the local guidebook Riga in Your Pocket for the maps and background information. You can get a copy from most kiosks, hotels, and travel agencies. Riga is World Heritage Listed and rightfully so, with 17th-century architecture and soaring church spires. Most of the streets are now traffic free and small shops and boutiques lie hidden down the warren of side-streets. The main thoroughfare is Kalku St, but most of the interesting sights will be found in the maze of crooked alleyways that branch off in every direction. In summer, tables and chairs are often set out right across Dome Square, which is dominated by the enormous red-brick Dome Cathedral. This is the biggest cathedral in the Baltics and work started on it in 1211. It is a wonder, both for its sheer bulk and the exquisite external decoration, notably its startling, intricate zig-zag brickwork. The interior of Dome Cathedral is much more austere. Much of the cathedral’s elaborate medieval interior was destroyed by Protestants during the Reformation. The main point of interest inside is the huge florid pulpit, covered with saints and angels and some very impressive stained glass windows. The most famous feature of the Dome is its massive organ with 6,718 pipes. When built in 1884 it was the largest in the world. Next to the cathedral main entrance is a cloister and courtyard. The cloister is considered a Romanesque masterpiece. The square outside the cathedral has a bright, fun-filled atmosphere with cheap cafes, beer tents and late-night bars open throughout the summer months. You must not miss the view from the triple-tiered spire of St Peter’s Church in Riga, the city’s trademark symbol. The church dates from the 1400s but the spire itself has been reconstructed three times. The first was built in 1660, mostly of wood, and again in wood in the 18th century after the original was burnt down following a lightning strike. It was destroyed again in World War II and rebuilt with steel in 1967. The spire is 124m high and a lift takes you to a panoramic viewing gallery about half way up. The church interior is not particularly interesting. Rioting protestants destroyed the original medieval furnishings in the 1500s but it is an excellent example of gothic architecture. It once housed many religious and art treasures but all were destroyed in World War II. Riga has one of the biggest concentrations of art nouveau buildings in the whole of Europe. About a third of all the buildings in central Riga were built in this style between 1896 and 1913. The most striking examples can be found around Albert St.
German, Austrian and Finnish architects influenced the Riga style, but the beautiful buildings also incorporate many elements drawn from Latvian culture. The most notable are five apartment blocks in Albert St and in nearby Elizabetes St is the Janis Rozentals Memorial Museum with spectacular murals lining the circular staircase. Steep roofs and ornamental motifs dominated in later years and good examples can be seen at Brivibas St and Terbatas St.
One of the largest markets in Europe, this lively bazaar is the major focal point of the city. The bustling, colorful market is held partly outdoors and partly inside five 35m-high zeppelin hangars on Negu Street, just behind the bus station in the south of Old Riga. You can buy virtually anything here, from a DVD player to a sheep carcass, with around 1,250 stalls. A wide variety of dairy products and fresh fruit and vegetables are also on sale. You can wander into a building entirely devoted to selling cheese and another just selling vegetables and, if you get lost inside, you won’t be the first. It has grown even bigger in recent years and now seems bursting at the seams. East of Old Riga’s jumbled streets is a band of parks and gardens, mostly laid out in the 19th century. Almost the whole of Old Town and New Town is separated by delightful and well-tended parks and wide boulevards that between them make up nearly 20% of the Riga city area. Parks on either side of the Freedom Monument on Brivibas bulvaris were created around 1860 but Vermanes Gardens, opened in 1817, is the most popular park. Attractions include a bronze fountain, ice rink, open-air theatre, and Riga’s first rose garden. The largest park in Riga is Uzvaras Park across the Akmens bridge built around 1910 and dominated by a Soviet war memorial, paid for with contributions deducted from Latvian workers’ pay packets. Smaller parks include Arcadia with a mill pond, Festival Song Park with playgrounds and several fountains and Riga National Zoo, much expanded and improved in recent years set in pine forests close to Kisezers lake. It houses about 3,000 animals including elephants, bears, and ostriches. Alongside the parks are impressive boulevards, most notable Raina Boulevard lined with imposing 19th-century mansions now mostly occupied by banks, embassies, and Riga University. This chilling reminder of atrocities carried out by the German Nazis is not for those with a sensitive nature. Between 1941 and 1944 an estimated 100,000 people were murdered at Salaspils concentration camp, about 14km southeast of Riga. It began life as a transit camp for Jews being deported to other slave camps and extermination sites but became a death camp in its own right. There is a small museum here and some sobering illustrations of life in the former camp. The approach from the railway halt at Darzini is along a pine forest path that takes about 15min. Riga is simply choc-a-bloc with museums and galleries. There is a huge number of them and most of a very high standard indeed. Most open daily, except Monday, and the range is quite astonishing – from art to firefighting, from medical history to photography. There are several museums on Latvia’s history, especially the war years, including the Museum of the Latvian People’s Front and the Jews in Latvia Museum. Art museums include Dauderi Museum of Culture, the National Museum of Fine Art, the Museum of Decorative and Applied Arts and the Museum of Foreign Art. Memorial museums are everywhere – the Andrejs Upitis Memorial Museum, the Ojars Vacietis Memorial Museum, the Aleksandrs Caks Memorial Museum, the Janis Akuraters Museum and the Krisjanis Barons Memorial Museum are just a few examples. Science is covered by the Latvian Nature Museum, the Pauls Stradin Museum of Medical History, the Museum of Pharmacy and Museum of Anatomy. As well as the Motor Museum there is a Mini-Motor Museum, the Lattelekom Telephone Museum, the Latvian Railroad History Museum and a Museum of Aviation alongside special interest museums such as the Theatre Museum, the Riga Museum of Cinematography, the Latvian Museum of Photography, the Latvian Television Museum, the Riga Porcelain Museum, the Latvian Fire-fighting Museum, the Latvian Sports Museum, the Latvian Museum of Architecture, and the Latvian Museum of the History of Electricity. You can add many smaller museums such as Mentzendorf House, the restored home of a wealthy merchant and memorial museums to various artists and writers. The best source of information about Riga’s museums is the Latvian Association of Museums. This is only a quick rundown of the most popular. Riga Motor Museum is 8km east of Old Riga. To get there catch a bus no. 21 from the Orthodox cathedral. On display are cars including a 1934 Lincoln that belonged to the writer Maxim Gorky and a 1966 Rolls-Royce Silver Wraith used by Leonid Brezhnev. There are also cars owned by Stalin, Khrushchev, and Molotov and, in addition, you can see life-size figures of the men themselves. But pride of place is a Hansa Renntorpedo sports car that competed in a Berlin to Moscow race in 1914. A disturbing and often moving display covering the Nazi occupation of Latvia is found in this forbiddingly ugly building at the western end of Ratslaukums alongside displays about the resistance of locals to the Bolsheviks during the Russian Civil War and their deportation to Siberian prison camps. Haunting portraits of Stalin and Hitler hover over the entrance. There are photographs, documents, maps and artifacts and a replica of a prison barracks from the Soviet gulag. Sounds dull as ditchwater but this is a not-to-be-missed museum found on the shores of Lake Jugla about 12km to the east of Riga city. Here are more than 100 Latvian traditional rural buildings, mostly of made of wood, including churches, farms, and windmills. Inside are artifacts from a bygone age on every aspect of Latvian rural life. On summer weekends there are old dance festivals and a craft fair. Public transport is good – catch a bus from Brivibas St. This museum is housed in a very grandiose building, with galleries giving an exhaustive view of Latvian art through more than 52,000 works though not all are on display. The gallery had little funding for many years and relied on donations and bequests, so the main collection is worthy but dull. Latvia has several hundred kilometers of coastline and its seaside beaches are enjoyable all year round. Riga is only 15km or so from the sea so it is a good way to combine a city break and beach holiday. In a country steeped in history, there is also plenty to enjoy inland with acres of pine forest, beautiful countryside, and historic castles. For the energetic, there is a national park packed with interesting things to do and for the more sedate there are not only castles to visit for summer palaces too. The most popular ones have good public transport links while others are easy to get to by car. The seaside resort of Jurmala makes for a popular day out for the people of Riga. Jurmala is the Latvian name for seashore and it is actually a string of small seaside resorts about 15km north west of Riga and 30mins or so travel time by train or bus. The train is marked to Dubulti and you need off at Majori station to get to the beach, which is a long stretch of fine white sand backed by pine trees and sand dunes. In summer the sands are heaving with visitors but it is still a pleasant excursion with its brightly painted wooden houses and low rise holiday apartments. There are plenty of cafes and restaurants for lunch and gift shopping is catered for with plenty of small shops, with amber jewelry shops the most interesting. If families tire of the beach there’s a very good warm water aqua park there. The Guaja river falls from uplands about 90km east of Riga to the Baltic. The most interesting stretch is the valley between Sigulda and Valimera which is a national reserve. The Guaja National Park was created in 1973 and has a well-maintained network of nature trails and adventure sports on offers such as canoeing and bobsledding. Regular trains and buses leave from Riga for Sigulda, not so much a town as a woodland resort set in an astonishingly beautiful landscape There are two castles in the town. Sigulda Castle itself lies in ruins but the reconstructed castle of Turaida and Krimulda are close. Turaida stands in extensive and well-planned gardens, houses a museum and has an old wooden church and a sculpture collection. The nearby Gutmanis caves are another popular attraction with graffiti on the walls said to date back to medieval times. The only cable car in Latvia goes up to the Krimulda Manor which was once a guesthouse for visiting noblemen in the past. The cable car ride gives a great view of the valley. Rundale Palace is about two hours south of Riga on the way to Vilinius. A hire car is probably the best way to get there. It houses some of the most outstanding examples of rococo and baroque art in Latvia, a monument to aristocratic excess. It was built between 1736 and 1740 as the summer residence of the Duke or Courtland. The palace has two floors and 138 rooms. It was designed by the Italian Francesco Bartolomeo Rastrelli, who also designed the fabulous Winter Palace in St Petersburg. Most interesting is the Golden Hall with its beautiful ceiling and chandeliers and the Grand Gallery with its intricate stucco. The palace also houses permanent exhibitions of furniture, porcelain, and paintings and, behind the palace, formal gardens have been carefully restored.